I was looking for a camping/backpacking , do most everything knife. I ended up with two of them. A friend had the Bark River which I acquired for a very reasonable fee. Ordered up a sheath, it arrived a few days ago. Also liked another friends ESEE 3, so I ended up with the Ontario RAT 3 clone/close relative. Carried the Ontario with me the past few days on a 15 miler up in Glacier Park, with an overnight at the Granite Park Chalet. Toughest chore was opening a few freeze dried food packs, and paring up an apple. But I like it. Bighorn ram we saw on the way in. 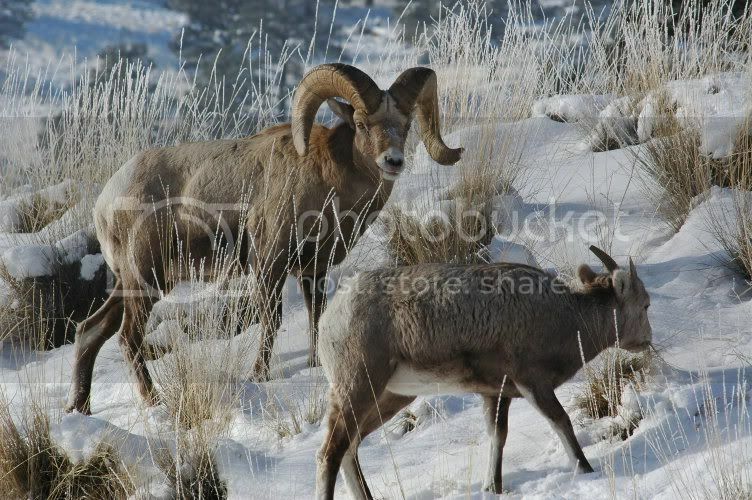 That’s a nice looking bighorn there, I sure wouldn’t mind him on my wall. I also really like the esee 3, it’s like the Glock 19 of knives in my opinion. Esee 3 I s great knife!!!!!! 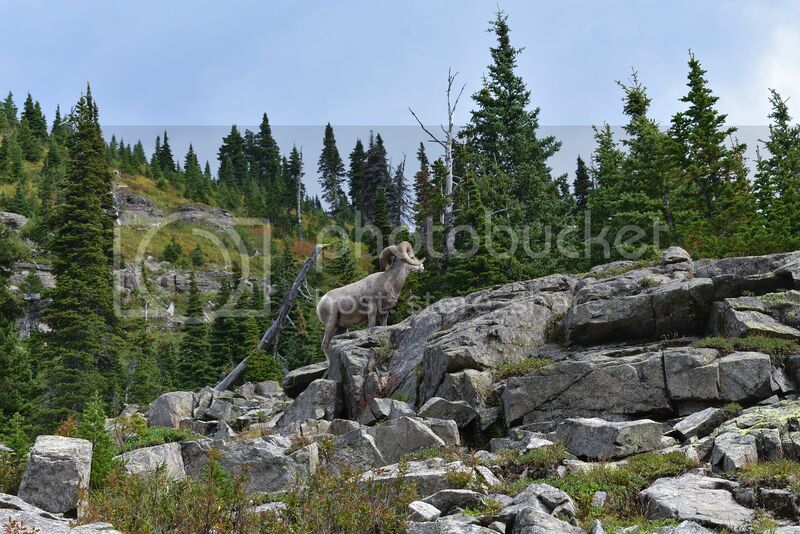 Beautiful area, love the Big Horn Sheep. 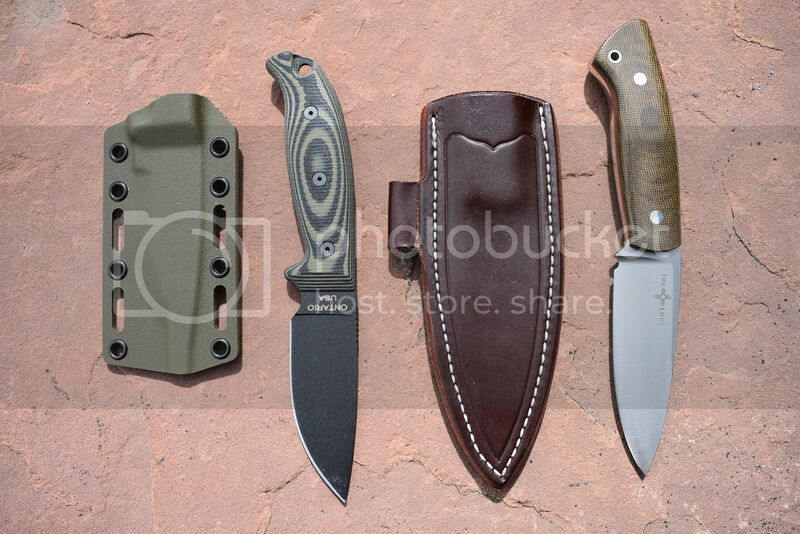 I carry similar sized knives when out and have gifted a Esee or two, all you need when hiking. A herd that came down several winters ago when we had a break in the weather. They came down to feed. Taken 200 yds from where I'm typing now. How easy/hard is it to get a tag for those as a resident? I’ve hunted them in the unlimited areas north of Yellowstone which was insanely difficult 2 times now but eventually I’d really like to get an actual trophy bighorn. NO idea how tough a tag would be for anyone..IN or OUT of State. Never tried for sheep, goat or moose. I'm happy with deer and elk. You could contact the State F&G HQ in Helena and speak with one of the Wardens. Aw man I was expecting some old Kamp Kings or Camillus camp knives. Hey FN, I'm not recognizing that logo on the Barkie. What model you got there? It's a discontinued model. It says " Joe Luis" on the blade. Also red spacers between the tang and the scales. With a nice palm swell design. Did a search, it's called a Santos model?